I have so many blog posts in my head, waiting to be written but I just thought I would do a little post about some bloggers that I love - but also in real life. So by that I don't mean people I talk to on twitter or whatever, these are actual people from my life that I knew before blogging or aside from blogging. Does that make sense? This may seem a little random but I thought it might be vaguely interesting? The girl behind Styleaffix is one my old (we graduated wahoo!) university friends - she was on my course and we were also both editors at The Courier aka our student newspaper. I've mentioned Elissa's blog before because it genuinely is one of my favourite blogs to read because she writes all about beauty products with a bit of fashion thrown in there for good measure. She's super honest in her product reviews and I just think she's got a really good blog going on! Oh my god this girl. I also went to university with Amy (she's a wee bit younger than me though) and she is just the coolest girl ever. She is just the sweetest person and I feel like her blog really reflects that. But mainly she has impeccable taste in fashion/beauty and she's a beaut (I mean, all of these girls are actually!) so I urge you to check her out if you haven't already. I swear Daisy started her blog fairly recently and I feel like it has already grown so much since when she started. Daisy is super passionate about her blog and I feel like she is really committed to creating regular, insightful content. 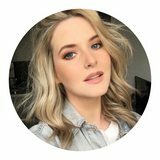 She's really involved in the beauty blogging community and I love visiting her blog to find out about new beauty products to try. GIRL CRUSH ALERT. Unfortunately there are no cringey selfies on her website like there are on mine so you won't get to see that. I also went to university with Sophie and she was also on The Courier editorial team. I don't even want to write anything about Sophie's website really because I feel like she's too cool for this post. But basically she likes music, she posts interviews, she's fit. I just love her. I feel like I have definitely missed out other people and their websites, but if I have I will do another post like this! I recommend you check out all these blogs because I love them so I'm sure you will too. Oh my god too funny! I remember he commented the same thing on an old post of mine.